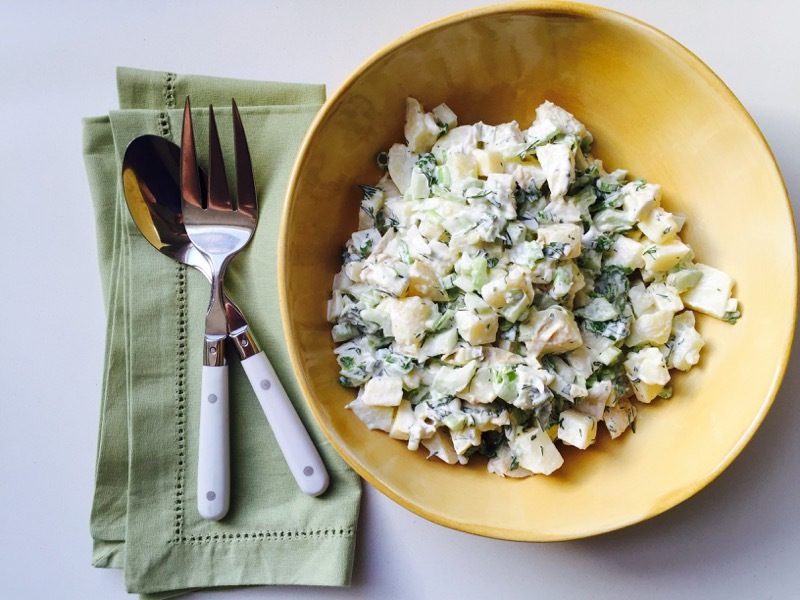 Want to know the #1 secret to potato salad? Don’t dress the potatoes while they are warm. That’s what I used to do, until I learned that chilling the potatoes before cutting them means they hold their shape much better and they don’t absorb as much dressing so you can use less. Now I cook the potatoes one day and make the salad the next, which has the side benefit of splitting up the prep. Secret #2 is to add lemon. It balances the richness of the mayo and keeps the flavor lively even after a day or two in the fridge. Oh heck, let’s keep going: secret #3 is to slice the entire green onion because those dark tops are full of flavor and shouldn’t be thrown away. And secret #4: leave the peels on for extra flavor, not to mention fiber and minerals (if you don’t like peels, pare them away with a knife). And last but not least, serve this with amazing ribs or stuffed summer sandwich. Drop the potatoes (do not peel) into a pot of boiling salted water and cook until a sharp knife slides easily into the center of a potato, 20 to 30 minutes depending on size. Drain and let cool completely in a colander. Refrigerate potatoes until cold, about 4 hours or overnight. To make salad, grate the zest of the lemon and squeeze the juice and set aside. Cut the cold potatoes (with or without peels) into 1/2-inch cubes. Put potatoes in a large bowl with green onions and celery. In a small bowl or measuring cup, whisk together mayonnaise, lemon juice and zest. Pour over potatoes; add herbs and fold the ingredients together with a large spoon. Taste and add more mayonnaise if desired. Serve right away or refrigerate, covered, up to 1 day.